Swedish Open in Båstad is an annual tennis tournament that for nine years in a row has been voted “the world’s greatest tennis tournament of the ATP Tour tennis player”. A long time sponsor of the Swedish Open is Dagens industri, one of Sweden’s biggest business-oriented newspapers. For several years Dagens industri has also published a special print edition, “DI Tennis”, which features content from and around this tournament and tennis in general. 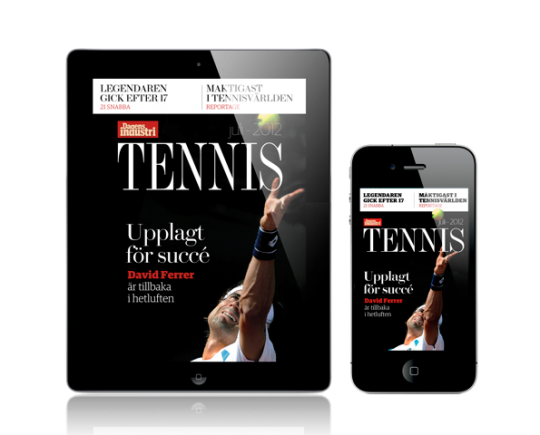 For this year’s tournament, which takes place July 7 – July 22, Dagens industri is for the first time launching DI Tennis on the iPad, Android and iPhone. Produced on the mag+ platform, the app edition is the destination for tennis fans and enthusiast looking to stay on top of the game. It includes interviews with famous tennis players, news- and score feeds and other information from and around the tournament.